A major war just broke out last night at GMT+0 (City Time) 2—4 o’clock! The whole area was covered in blood and crime ops running amok everywhere, disorientating the entire map! Even the whole battlefield were packed Observers till the brink!!! There no denying it, that match was the most heated of all the other battles in the Octofinals Match. City 39 is lead by its team Trio: [隱士殺手]the current Global Tournament’s Champion and 2 other Top Tier Leaders [心語殺手] & [broken killer] along with 2 more powerful leader: [咖波殺手] and [歐北嚨殺手]. Their styles are hit fast, hit hard and swift like the winds. Our defense is offense! Attack, attack and keep on attacking! 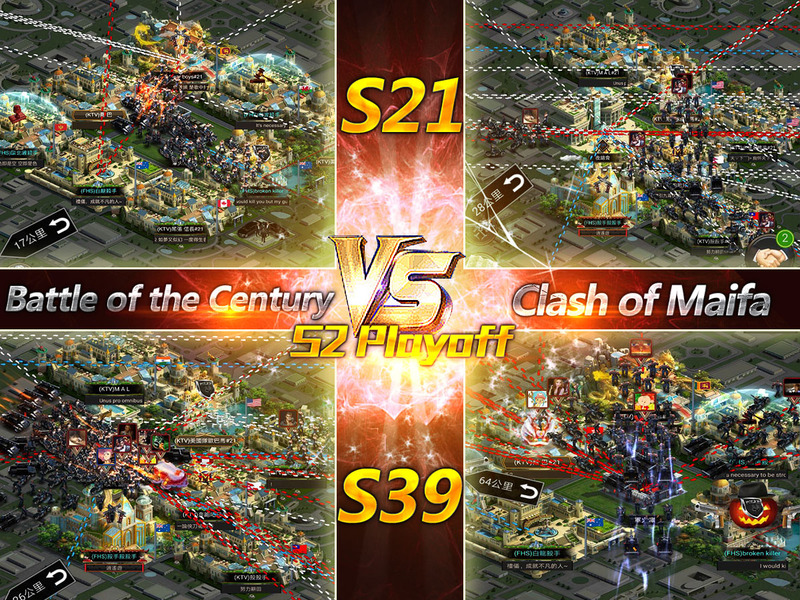 Then there is City 21 represented by 美國隊, unparalleled in strength and unmatched in numbers; Although, only managed to be placed 2nd in the previous Clash of Mafia Playoff, they are still a force to be reckoned. An extreme team based on clear labor division and reasonable arrangement; advancing with steadiness. You may be fierce like a lion, but we are a pack of wolfs! Daring, Challenging, Fearless and a Pack!!! As the horns of war sounded the battlefields, team Trio of City 39 took the initiative using their advantage of firepower along with strategic Crime Ops to strike various turfs with swiftness and precision, greatly displaying the art speed and power! After careful planning, City 21’s [Annie Bunny] made the first moves and filling the role of vanguard. While [奔跑吧兄弟], [war boys], [美國隊歐巴馬] and [美國隊小金] from美國隊 filled the role of Center; At the same time various other powerful leaders acted as support, coordinating with others to ensure a steady victory. The battle was constantly changing, shifting the outcome with every passing minute, seconds. At first both sides only tested each other, feeling each other’s strength and capacity; but what came next was a massacre a fight to the deaths! Reinforce must be fast, Attack must be faster and arrangements must be even faster!!! Slowly but surely the bloodbath begins. At fist City 39 was taking the lead but later, with unmatched cooperation, coordination and careful Raiding City 21 managed to even the score as well as overtake them. Sadly, such victory did not last, after great effort City 39 manages to shorten the different and once again overtake their opponent just before the battle ended. Thus concluding the most exciting and heated battle of all times! Remember! In Clash of Mafia Playoff crews can die! Every battle has a winner and a loser, something a little more preparation or a little more planning is all it takes to determine who wins and who loss. But the evolution of Battle Strategic is definitely not determined by one war or by 2 cities. Battle Strategic is not about winning or losing, it is an art; an art worthy of being dedicated and understood. Now Secretary would like to appeal to all Bosses to submit their own script, describing the battles that occurred in Clash of Mafia Playoff’s Octofinals, Quarterfinals and Semi-Finals matches. Those whose script has been selected will be immediately published on Facebook, Official Website as well as on the Latest News by Secretary. A reward of 10k Gold will also be given to the writer of the selected script!